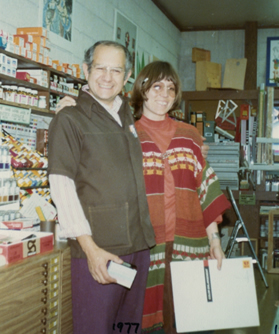 It started in the early 1950’s as the Torrance Gallery; shortly thereafter art supplies and framing were introduced. Creek flooding on San Anselmo Avenue and the heavy losses that were incurred created a desire to move to higher ground.. In 1963 a new building was completed at 128 Greenfield Avenue. In 1964 a partnership with Perry Paradiso was created and subsequently Perry became sole owner. To better reflect the nature of his business and to differentiate it from the picture gallery operation upstairs the name was changed to Perry’s Art Supplies and Framing. excitement of bringing an idea into reality, H e uses these abilities daily in the framing department and other areas. He enjoys his work and hope to work as long as possible meeting the everyday challenges associated with artists and the public interest in Art. Perry has served as president of the Marin Society of Artist and has contributed to and supported local schools and community in many ways. The store focuses on serving the evolving needs of the local artists rather than simple merchandising products per se. People are happily surprised in what they find in the well organized store. “They come with problems and we solve them” he says. “ I want to remain a small and friendly local store where you can actually ask questions and get good advice”. Perry Paradiso was born in Richmond, Indiana to Italian immigrant parents. He had a love of building things which he utilized while attending school by working with construction professionals his father would hire in remodeling adventures. He attended Richmond schools and was president of his senior class of 354 students.He was awarded a one year merit scholarship to Earlham College. As the military draft for the Korean war began to close in he joined the ROTC at Michigan State University and subsequently graduated from Miami of Ohio with a major in business and a officers commisson in the USAF. As the war came to a close he found himself in California working in USAF Auditor General’s staff. He visited Marin and fell in love with it. That love eventually prompted him to join the Marin Conservation League and Marin Agricultural Land Trust to help protect the land that artists find so inspirational. He also played a significant role in sparking and protecting forever the 22 acre Hawthorne Canyon for open space. He feel good about that. Perry and his wife, who is a classical pianoist, have a son and a daughter; both of whom are professionals in education and medical fields respectfully. In May 2014 Perry celebrated 50 years continuous service by crossing the threshold of 128 Greenfield once again.